Ta-Nehisi will be starting from his work-in-progress, a historical novel set before during and after the Civil War, told through multiple voices — of slaves and former slaves, slave-holders and more. Readers of this blog will remember Ta-Nehisi’s exceptional work on recovering some of the willed forgetting that marks so much Civil War history during “Confederate History Month” a year or so ago – DennisG highlighted that work as he added his own contributions to the effort. This latest work is the next iteration of that inquiry — and Ta-Nehisi will talk about some of the specific challenges he’s facing as he tries to write through facts into the sound and texture of the past. Ta-Nehisi Coates is weighing in on this claim about who tops who. Postbourgie says Sam, no contest. TNC waffles — it’s the old spikes of excellence vs. body of work wheeze, but what got me going is that when he sees the lines blurring as white kids rise to clap for Sam Cooke’s rendition of “Blowing in the Wind,” that gives me the excuse (as if I needed one) to post this retort on Marvin Gaye’s behalf. This was a Rubicon, IMHO. A revelatory approach to this song. There’s the virtuosity — no singer me, but still I know from talking to a lot of performers how challenging it is, how brave you have to be to stand out there on an island, all by yourself, sing damn near a cappela, and hit every moment of feeling just as you imagine it — especially on a tune as famously singer-hostile as the Star Spangled Banner. On national TV. Live. And there is sheer fact of ownership. That song, for that moment, is Marvin’s property, lock stock and barrel — and he’s laying the fact that this song belongs not just to one narrow idea of America but to a much bigger one. And he’s doing so to start a celebration of America’s blackest major sport beamed out on mass media, when that term actually meant something. If in Sam Cooke’s performance TNC sees a major milestone, then this is surely another. Marvin Gaye provided a big part of the soundtrack of my youth, and Cooke, for all his unquestioned wonderfulness, much less so. So my props go here to the man who I still think had an almost perfect sense of the song. A brother in that position not only would not be considered for 2012, he would be impeached when he returned to governorship for embarrassing the state, and then have his ghetto card revoked for embarrassing the local Negrocracy. For this, the writer is grateful, which makes perfect sense. It’s better by far to have a strong sense of standards than some unthinking identity commitment. That’s the implication of the Yiddish phrase, “A shande fur de goyim” — a shame before the non-Jews. Nothing could be worse than to be such a schande; it’s why Jews, or at least those I hang with, wince with every Jack Abramoff or, to channel a different era, why Abbie Hoffman’s use of the phrase to describe Judge Julius Hoffman during the Chicago Eight trial was such a potent barb. White racists have taken a lot of heat on this blog. But the truth of the matter is that they may be the single biggest promoters of black excellence in this country’s history. There is a reason Tony Dungy was the first winning coach in Tampa Bay’s history–he had to be. The same dynamic played out time and again in public and in private Jewish lives — including the importance of public heroes finding someway to express both a particular and a universal greatness; think of Sandy Koufax refusing to pitch on Yom Kippur and you have a hint of the balancing act involved. … A little bit of bigotry would have prevented all of this [the Palin debacle]. So to all the Ferraros out there I have one request–more racism please. It improves our stock. It makes black people, a better people. No, it does not. I don’t think you could or should credit racism for what Dungy can claim as his own achievement, nor that of Einstein, perhaps — or more on point for a science-and-public life blog — the life Percy Julian lived. Percy Julian is not as well known as he should be. Get introduced to him out here, and or watch the excellent two hour biography that NOVA broadcast a year or so ago. Ruben Santiago-Hudson, who plays Julian, is worth the price of admission on his own, and to brag a little, my wife, Katha Seidman won her second Emmy for her design of the show. The short form: Julian was one of the pioneering synthetic chemists of the between the wars period and just after WW II. If you have ever used a cortisone cream, other corticosteroid medicines, or birth control pills, you owe Dr. Julian a debt of thanks. He had a great career; he was honored (belatedly); he got rich — all good. He also was bedeviled by racist constraints from childhood through to the time he was getting his own company off the ground, and in particular institutional and individual bigotry kept him from the first career he intended to pursue, that of an academic chemist, pursuing whatever research that seemed to him most promising. That he made an enormous contribution to his field as an industrial chemist is a tribute to just the kind of determined excellence Ta-Nehisi celebrates in Dungy. But the price paid, the cost in opportunities not just lost, but actively barred has to be accounted for too. I’ll stipulate that Ta-Nehisi knows this very well indeed. For my part, I’m lucky that my ethnic identifier, in this country at least, is farther removed than his from our own versions of the ghetto and Jim Crow. It was my great-grandfather that made it out of the old country, and his stories have not survived the passing of the last of his own children. I am not completely tone-deaf to irony and sarcasm either, nor the echoes of that supremely useful phrase “the soft bigotry of low expectations” as applied both to Governor Palin and such sometime-symbolic figures as the athlete formerly known as Pacman and Mike Tyson. But I still think that Ta-Nehisi is undercounting the persistant tax that bigotry imposes on its targets. You could call it the Julian tax, the daily toll exacted in the pursuit of excellence constrained within limits not of your own choosing. I’ll stop here — but for a truly beautiful meditation that touches on this theme (and much else) look to Bill T. Jones’ memoir The Last Night on Earth. 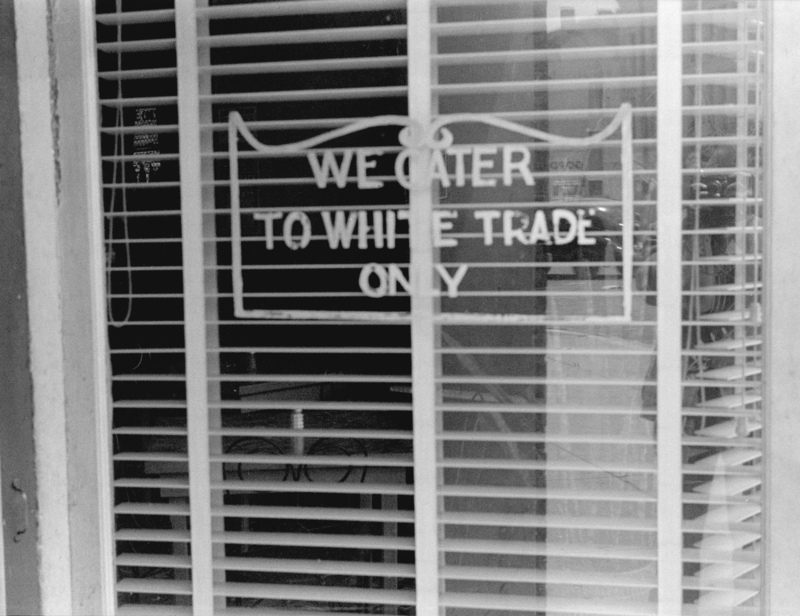 Image: Ben Shahn “Sign on a Restaurant, Lancaster Ohio” 1938. Library of Congress [http://www.loc.gov/rr/print/list/085_disc.html]. Source: Wikimedia Commons.